I absolutely love discovering cool, new tools that can help small business owners. Every day, as I fall down the Internet rabbit hole while researching blog posts and catching up on social media trends, I inevitably discover some new product or service. This time, however, Visme found me. In the past, if you wanted any sort of image or design, you needed to call in a graphic designer. With the overload of content that small businesses need to produce daily—whether for social media, their website, ads, etc—it’s hard to find someone who can design something on the fly and within budget. Sometimes you need a PowerPoint presentation right away or don’t have the extra money to spend for a single one-time-use icon. This is where Visme can help. This service enables anyone to “DIY” a beautiful presentation, infographic, animation, etc. With that being said, I want to emphasize that Visme is NOT a replacement for graphic designers. In fact, I could see many graphic designers using the program to streamline asset creation or to enable clients to work on small design projects while the designer can focus on the brand’s big picture projects. More on this in the “cons” section below. 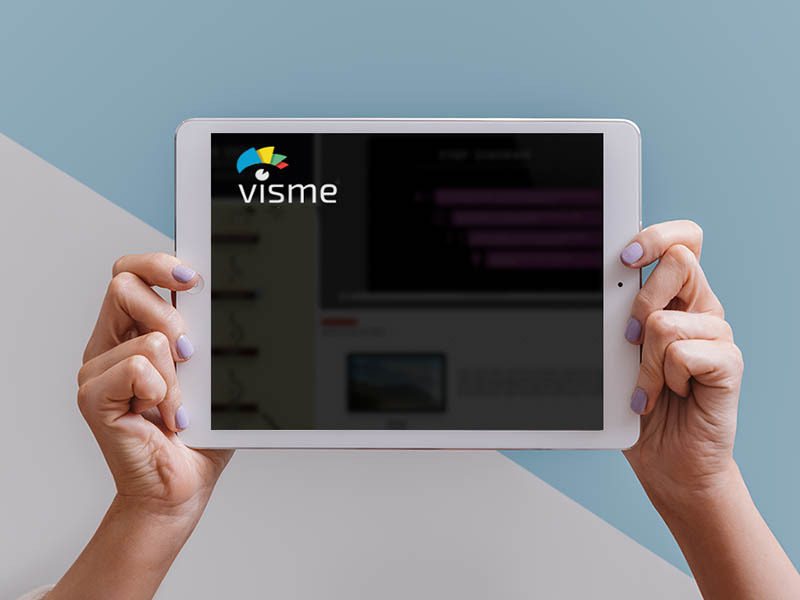 Here are the pros and cons of Visme and how I believe it can help your small business look damn good. I know how to fumble my way through Photoshop to get the basics done. It’s a clunky process, and is definitely not an amateur-friendly program. This is why I fell in love with Visme. The drag and drop options and intuitive user-experience makes this service so easy to use. I can get something done in seconds that would take me an hour in Photoshop. Plus, I know it’s something my clients would also be able to use with little guidance. I use Canva—a lot. It’s great to use if I need to churn out a quick social media post, but its selection of free icons and graphics is limited. Visme, on the other hand, has a bunch to choose from.I was impressed with the selection of bursts and line art that brought the infographic I was creating to life. The most difficult thing about the templates was picking out which one I liked best. You can use these as-is or as a starting point for your project—I ended up doing the latter. Instead of downloading a large file and sending it to Monika to review, I simply sent her a link. She was able to view the piece, suggest any edits, and I could go right back to work. No Dropbox required. In the wrong hands, these easy-to-use templates could become a disaster. This is where you NEED a graphic designer. Do you have established brand colors? Do you know the HEX and RGB codes for those colors and in what instances you use which type of font? Would you be able to spot when an image you’d like to use is “off-brand”? If the answer is “no” to any of these questions, you need to partner with a designer to establish your brand identity. From there, it might be safe to use Visme on your own, but it can’t hurt to continue partnering with your graphic designer to make sure you’re not going off the wall. Visme did not play nicely with Chrome, so I ended up moving to Firefox within the first ten minutes of starting theproject. Also, the program sometimes won’t recognize when you’ve selected a piece of content. I assume this is because I had used several layers so, admittedly, this might have been user error. As much as I loved the selection of graphics and icons, I found the stock photos were lacking. Some of the photos in the collection were amateurish, so I would use stock photos at this point. I anticipate their collection will grow over time. Overall, if you need to create a ton of PowerPoint presentations that you want to look really polished, this program is great. It’s also a fantastic user-friendly tool for building all sorts of design pieces—just make sure you’re either a very design-oriented person or have a solid partnership with your brand’s graphic designer. *Jansen Communications was not paid to write this review.